The foundational medical science upon which TCCC is based is published in NAEMT’s PHTLS Military textbook in which the military chapters are written by the Co-TCCC. TCCC, as offered by NAEMT, is the only TCCC course endorsed by the Joint Trauma System and the American College of Surgeons. 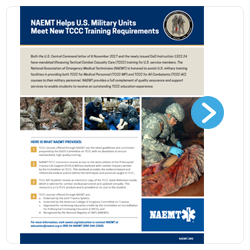 NAEMT’s TCCC courses are accredited by CAPCE and recognized by NREMT. NAEMT's TCCC courses are taught by a global network of experienced, well-trained, experienced instructors. To support training centers, instructors and students, NAEMT maintains a network of tactical affiliate faculty both in the U.S. and internationally, and staff at its Headquarters Office. NAEMT also offers Tactical Emergency Casualty Care (TECC) for civilian tactical EMS.